My husband purchased me a Tanzanian bracelet in distance from Effy. It was not fitting right and I was told to take it to their jeweler in Cozumel where he ruined it! I have never seen such poor workmanship. When we got back from our cruise I was told to send it to Effy in New York, I did that. That was back in March of 2016 and it is now September of 2016. I have not gotten it back nor have I ever worn it once! I have made a complaint with the Better Business Bureau New York. And 11 days later, Effy still hasn't responded! By the way Effy is not registered with the Better Business Bureau in any state. This is the worst company to do business with from which I've ever bought from! Buyer beware: Sugar drips off their lips until you buy and have a problem with customer service! Then you are sent to rafi a man who is not a problem solver at all. Quality and customer service are a big letdown! On a cruise three weeks ago, my husband decided to spoil me and buy me a new diamond ring since I lost my engagement ring over ten years ago. We have been married 25 years this year, and he wanted to finally get me another ring. 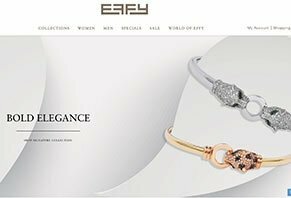 After hearing the jewelry shop workers boast about the amazing quality of Effy Jewelry, the lifetime warranty, and made in the USA brand, we purchased a ring valued at $2,995. Just two weeks after getting home, I noticed a rough feel to the band of my 24 karats white gold band on my ring. Upon further inspection, I was shocked to see that it was broken completely into. I was shocked but remembered what the workers said about the amazing customer service. So, I called. The lady did apologize as she told me it would take up to six weeks to fix. Okay, that stinks, but it is what it is. She then told me that I would get an email instructing me further. I was expecting a pre-paid shipping code, but instead, they tell ME that I need to pay for a certain shipping and insure the full value of the ring! Seriously? I have owned this ring for three weeks, and it broke in half. They should have offered to take complete and total responsibility for anything involved in getting it repaired and back on my finger ASAP! I guess we disagree on what customer service should be. Very poor organization and customer service. On 02.27.17, while cruising on the Carnival Vista, I purchased an Effy white gold blue sapphire bracelet. The paperwork (a receipt and certificate of appraisal), provided on the night before debarking, turned out to be for another item purchased by another customer. Upon returning home, I immediately called the Effy's customer service number and ended up speaking to a man who identified himself as "Rafi" and as a manager. When I explained the situation, he seemed not the least concerned about my situation and was more worried that I had another customer's information. In any event, he indicated that he would send the correct documents. This was nine days ago, and I have as yet to receive the promised materials. I called again today at 3:00 PM, only to be told by "Jessie" that all managerial and supervisory personnel had gone home. When I asked her what I could do to resolve the matter, she indicated that I should write an email to the address on their website site. How about that for sparkling customer service? I purchased an Effy ring while on a Celebrity cruise. The convincing sales representative stated that the ring can be traded in or upgraded by Effy at any time. We then asked if the ring can be made in white gold and they said that it can be done. So we purchased the ring and after several weeks it was delivered to our home and it was in white gold as promised. However, the emerald stone was not the same one that I purchased. During a phone call to Effy, I was told that the stone was indeed the same stone. Later, I contacted Effy to ask if I could visit their store in New York with intent to either trade the ring or have the emerald replaced. I was told that I must contact the cruise line, and they told me that I had to contact their customer service department, I think it is a contract service called Seaboard. After a month of phone calls and emails in which I asked to upgrade the emerald or to trade in the ring toward a different one, and their assurances that they will help, I am now told to send the ring to their company and they will see what they can do. This after they were sent copies of the receipts and Effy photos of the ring. I want to point out that we recently went on a cruise in the Caribbean and the Effy stores on some of the islands all repeated an Effy policy that we can upgrade a ring at any time. So I am lied to and given the runaround and neither Effy or the Celebrity cruise line cares. Oh, just to mention that the ring cost $1,500. One of my ring is Elephant. Very cute however the little tail broke already. I bought it less then 2 years ago. Second ring is the Snake, very beautiful black snake. However the eye, green stone fell off, I only bought this ring couple of months ago! Very disappointed, will never buy anything Effy. I contacted the company asking to help with repair but no answer. I purchased a sapphire and diamond ring on a cruise and within two weeks of purchase one of the diamonds fell out. It took me a week of emails and voice mails to receive a response from Effy and they told me to insure it and courier it to them at my cost. I emailed and left messages asking if they would reimburse the costs since the ring was only a few weeks old and they did not respond until I called the cruise line and complained. I then received a call from customer service and was told that Effy are not responsible for the cost and when I said that that since it was within two weeks of purchase, they must make poor quality jewelry, the customer service rep hung up on me. Do not purchase from Effy. I bought an Effy men's ring on a cruise in January 2016. I decided to have the ring resized up one size in July due to it always having been a little tight. The jeweler contacted me to say there was a lot of porosity in the white gold shank, making it difficult to resize, he said this was very poor workmanship. This ring was not the quality sold to me and I would advise consumers to steer clear of Effy if they want quality jeweler.